The main purpose of the Argonne Choral Group is to offer a place for vocalists and musicians to use/hone their talent, explore different types and styles of choral music, and provide entertainment to Argonne National Laboratory and the surrounding community. New members are welcome at any time. Dues are $5 per calendar year, payable to the Treasurer. Practices are on Monday and Wednesday from 11:45 am to 12:30 pm in the auditorium in Building 362 unless it is otherwise occupied. Starting date for the next cycle of rehearsals will be announced. The bylaws can be found here. Videos from the Safety in 60 seconds from 2011 and 2013 can be viewed in the gallery. 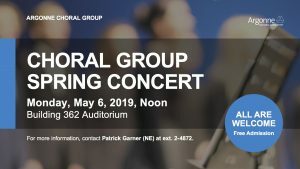 The Argonne Choral Group will present its spring concert on Monday, May 6, 2019 at noon in the building 362 auditorium. The concert contains music from Mozart to contemporary with both piano and cello accompaniment. The poster can be .from web by clicking here. All employees and site occupants whose schedules permit are invited to attend. Guests of Argonne employees are welcome to attend but will require a gate pass. Contact any Officer or member of the Choral Group to learn how to join.